KUALA LUMPUR: Tun Dr Mahathir Mohamad received a steady stream of visitors on his second day in hospital following a mild heart attack. However, he was allowed to see only a select few, as doctors did not wish to tire him out. The former premier's wife Tun Dr Siti Hasmah Mohd Ali received the rest of the visitors in an adjacent lounge where she updated them on the former premier.s condition. Datuk Mukhriz Mahathir said his father was taking it easy and spent most of the day in the armchair by the bed, reading a non-fiction book, As The Future Catches You, by Juan Enrique. Dr Mahathir, who was admitted to the National Heart Institute (IJN) in the early hours of Wednesday, was more alert yesterday. By 8.30pm yesterday, he was well enough to be moved from the Coronary Care Unit (CCU) to a normal ward. Mukhriz said doctors were pleased that his father had responded well to medication, and his appetite was good. .We have been bringing him food from home,. he said, adding that since December the family had employed a chef to prepare tasty but healthy food for him. The family has not allowed him any newspapers in hospital. .We tell him the news, but quite selectively. We don.t want him worked up. No, not controlling him, just trying to save his life,. Mukhriz said. Mukhriz, whose handphone had been swamped with more than 800 SMSes since the news broke that Dr Mahathir had been warded, thanked those who conveyed their wishes and prayers. Dr Siti Hasmah has also .checked into. IJN, in keeping with her practice each time Dr Mahathir is admitted to hospital. .She does that whether he goes for a heart problem or a foot ailment,. said Datuk Mokhzani, another of Dr Mahathir's sons. 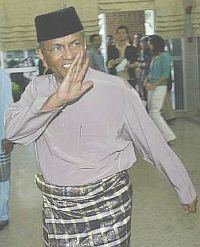 In a statement, IJN said Dr Mahathir spent a trouble-free night on Thursday, having eaten and slept well through the first night. It said Dr Mahathir underwent routine blood, X-ray and cardiography tests. Opposition Leader Lim Kit Siang, who met Dr Mahathir for 15 minutes, said he looked fine. .He was doing some reading when I arrived and we had a short chat,. he said. Other visitors included Information Minister Datuk Seri Zainuddin Maidin, Datin Seri Rosmah Mansor, Datin Seri Wendy Ong and Tengku Razaleigh Hamzah.